Greenwich Cemetery contains 680 burials from both the First World War and from the Second World War. Greenwich Cemetery contains 556 First World War burials. More than half of these graves are scattered throughout the cemetery, but 263 form a large war graves plot known as 'Heroes' Corner'. Here, two curved screen walls bear the names of casualties buried both in the plot and in unmarked graves in the cemetery. The Second World War plot adjoins and contains 75 graves. An additional screen wall commemorates casualties buried in this plot and ten others buried in unmarked graves elsewhere in the cemetery. 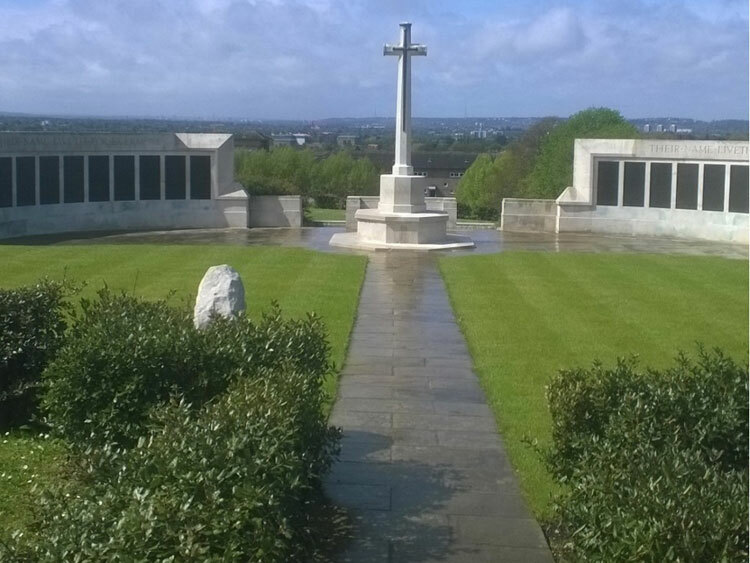 In all, the cemetery contains 124 Second World War burials, 3 of which are unidentified British soldiers. One of the burials is that of a soldier who served with the Yorkshire Regiment. We are very grateful to Chris Doran of the Find a Grave website for photographing the commemoration of this soldier on the Screen Wall. Select the above image for a larger sized one which opens in a new window. Lance Serjeant George Albert Taylor. 10158. 10th Battalion the Yorkshire Regiment. Died at home 19 October 1915. Aged 24. Born Chadwell (London), Enlisted Stratford (London).